The broad framework of economic policy evaluation methods evolved over 150 years of the development of economic thought can inform these policy choices [to address impacts of human productive activity on a global scale], but public and scholarly discussion of global warming often fails to apply these methods consistently. One deleterious consequence of the failure to analyze the economics of global warming correctly is the widespread, but erroneous, belief that policies to reduce greenhouse gas emission will impose a cost on the current generation, which must be weighed against the benefits future generations will enjoy from mitigation. Because greenhouse gas emissions are an unpriced economic externality, this belief is incorrect. Correcting the externality by imposing a price on greenhouse gas emissions, whether through regulation, taxation, or a system of tradable emissions permits, together with appropriate compensating measures, can increase the consumption of economic goods and services of both future and current generations. Figure 1: The heavy (blue) line represents combinations of E and K compatible with the present level of consumption of the current generation. Without mitigation of global warming the current generation will bequeath effectively zero climatological capital to future generations represented by the point (E now, K now). The lower dotted (green) curve shows the combinations of E and K that would allow future generations to achieve the same level of consumption. Because the marginal cost of mitigation at the original point is zero, but the marginal benefit of mitigation for future generations is positive, the current allocation is inefficient. 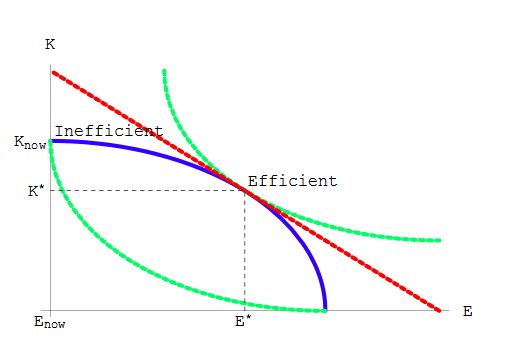 It would be possible without reducing the consumption of the current generation to move to (or closer to) the efficient allocation of investment, (E∗, K∗), at which future generations could enjoy a higher level of consumption, represented by the upper dotted (green) curve showing the combinations of E and K that would allow future generations to achieve a higher level of consumption. At the efficient point the marginal cost and benefit of mitigation in terms of conventional investment are equal. The straight dotted (red) line represents the price of mitigation in terms of conventional capital at the efficient allocation. What does media bias look like?